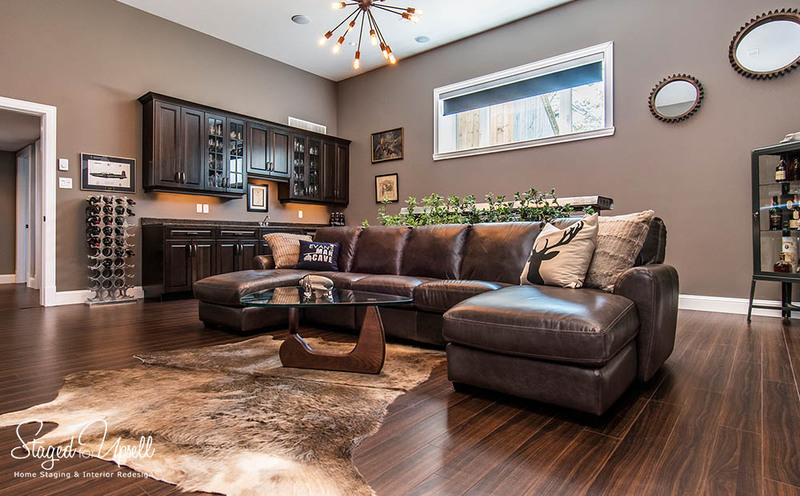 What a year it has been as a home stager in Halifax! We rolled into our fourth year in business in the fall of this year. It was our best and busiest year to date. We owe that to our amazing clients, home owners, realtors, home builders, developers, photographers that make our work look awesome, and our awesome fans! When I started writing this I thought I might not have enough to talk about for a recap…but so much has happened! 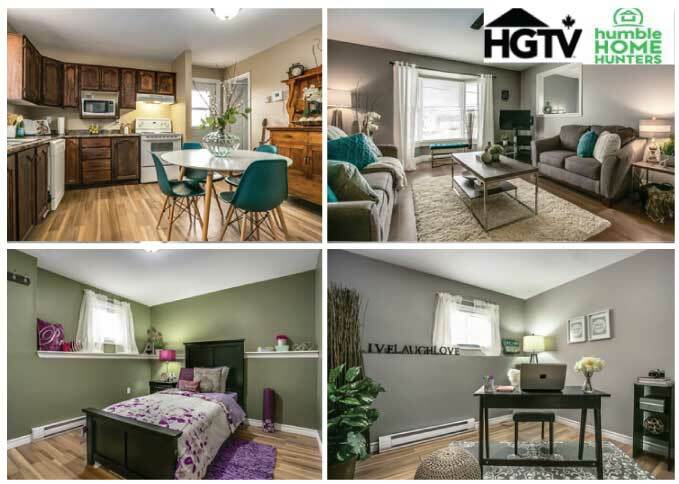 Early this year we rolled out our involvement in HGTV’s Humble Home Hunters where we staged an owner occupied home for the show targeting first time home buyers. That was an exciting project to be part of and it was great to finally have the show air and be able to share photos with everyone. 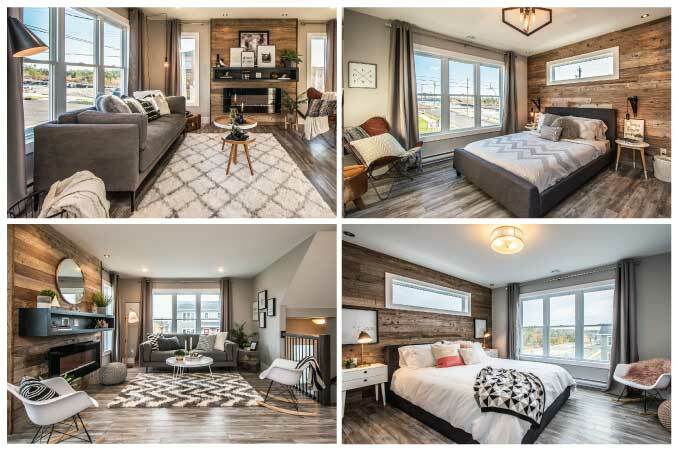 One of our favorite model home staging projects we worked on this year was Armco’s Information Center/model in Indigo shores. Staging it in modern urban cottage style we were able to work with local furniture designers, Relove to bring them into the project to create a reclaimed wood wall and a reclaimed wood headboard. Check out more by clicking here. 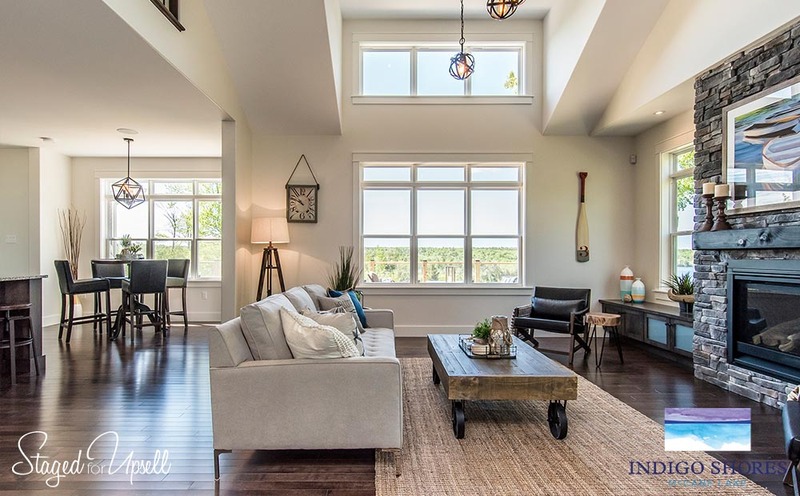 Gorgeous great room in the Indigo Shores Information Center. We were nominated for 2017 Halifax Small Business of the Year. Only being in our third year of business at the time of the nomination it was an honour to be nominated! During the summer I was approached by Wicker Emporium to work with them as a photo stylist. Trending away from their traditional furniture it was a lot of fun to work with them, and photographer Justin MacDonald to create some cool, trendy styles for their fall collections. We’ve already had a peak at the new spring collections – wait until you see the coastal collection…gorgeous! See more pics by clicking here. I brought on the lovely and talented Stephanie LaRue. She was a perfect fit for Staged for Upsell. 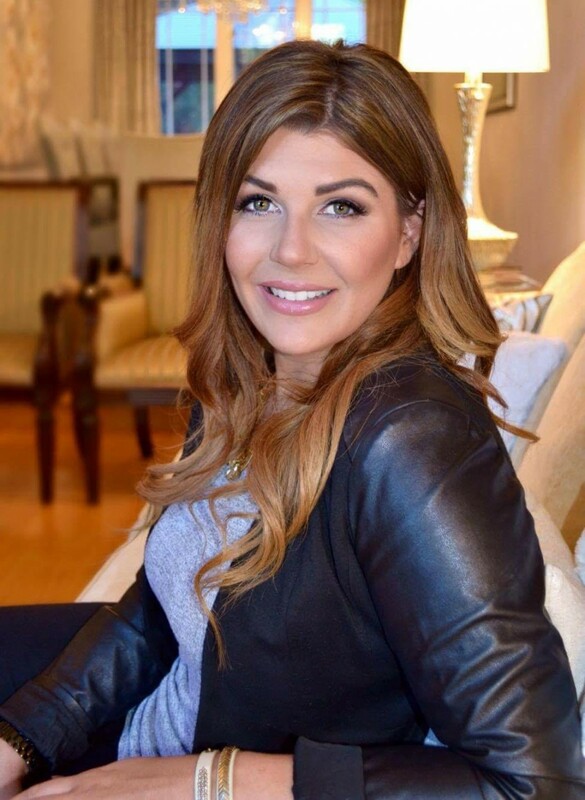 Stephanie had experience as a home stager and decorator, and she also has the added talent of being a kitchen designer! I couldn’t be happier having her on the team – just love her! To learn more about Steph click here. Work was plentiful this year, a blessing indeed! We more than doubled our furniture inventory over last year and now carry Halifax’s largest home staging furniture inventory. How much you ask? For example…16 sofas, 17 dining tables…and much more. We will continue to expand it next year to meet the needs of our clients. We had the opportunity to have some interior decorating students work on some projects with us, notably Lindsey King who is finishing her two month internship with us soon. Here’s a before and after video of just some of the vacant properties we staged this year. Armco Capital’s Governor’s Brook development kept us quite busy late this fall with three model homes, and another we are working on right now. Here’s a few photos of two of the units staged in a trendy fashion targeting first time home buyers. We started working with realtors, home builders and developers this year that we hadn’t worked with in the previous year. Many of them I now consider friends. And to end the year, I was voted Top 10 Vacant Home Stagers in Canada by RESA. Very humbling indeed and very special as it was peers in the industry internationally that voted. To read more click here. Things look bright and awesome for 2017! We’re working on a few exciting things right now that will hopefully come to fruition. Thank you to all our clients, associates and fans for making 2016 so amazing!